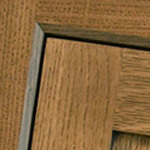 The profiles below illustrate the many options for door edges that you can use when designing for inset cabinets. Be careful to choose the correct profile(s) that work well with the frame profile on the cabinet (flush inset, beaded inset, champfer inset, Ogee inset, etc) as some profiles work better with the frame design than others. Only Pattern B is available on inset edge profiles. L304 and L996 are premium edge profiles and carry a $15/door or drawer upcharge.